Sometimes, I’ve found that products that are fair-trade, non-GMO, gluten and paraben free, biodegradable and sustainable are simply unusable because they don’t smell good, don’t feel good or simply don’t work. Of course we all want to support businesses that create products with these kinds of attributes, but at the end of the day, I’m buying said product to wash my hair or de-wrinkle my skin and I want them to do their job. 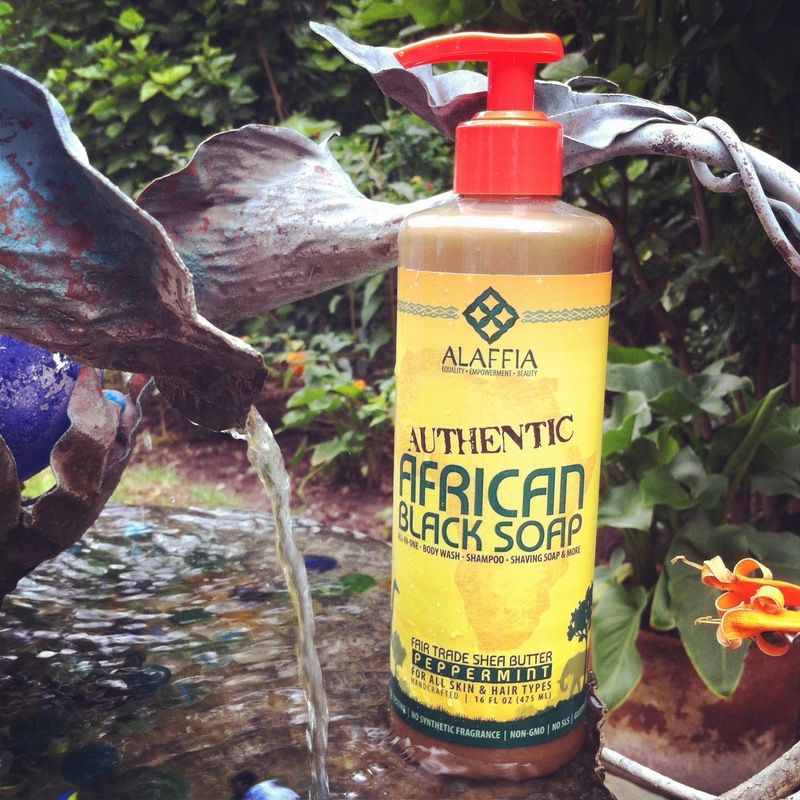 Enter Alaffia Authentic African Black Soap. This all-in-one body wash, shampoo shaving cream and facial cleanser is a minor miracle in the beauty closet and is environmentally friendly and fair trade. Read on. Black soap is a popular cleanser in West Africa, known for its detoxifying and purifying properties. Made from a centuries old recipe of locally made shea butter and West African palm kernel oil, the concoction is boiled with ashes then dried in the sun for three weeks to create the famous soap. At first glance, the black soap appears more the color of brown sugar, a dubious color for soap in my opinion, but I decided to give it a try. First test, hands. It feels surprisingly smooth—I expected it to be gritty when I read about the ashes. The soap immediately worked into a rich lather that smelled of peppermint (Alaffia also offers the black soap in a Tangerine Citrus scent or unscented). My hands felt well cleansed, and the soap was not overly drying on my skin. Next test? Face. Same as the hands and no redness or breakouts. I have yet to use the product in all of the ways possible, but I have no doubt that it will do its job in every possible method. I’m also a huge fan of the super hydrating but not at all sticky Everyday Coconut Body Lotion, the Everyday Coconut Face Toner and the Everyday Coconut Eye Cream, all of which smell divine. Though Alaffia is a company based out of Washington State, it was founded in the hopes of alleviating poverty in West Africa through fair trade. In addition to concocting sumptuous and effective beauty products, Alaffia has created myriad programs to benefit the people in West Africa who create their products. Beauty products that feel good, smell good and do good? Count me in. ← Milestones for The Chic Adventurer!